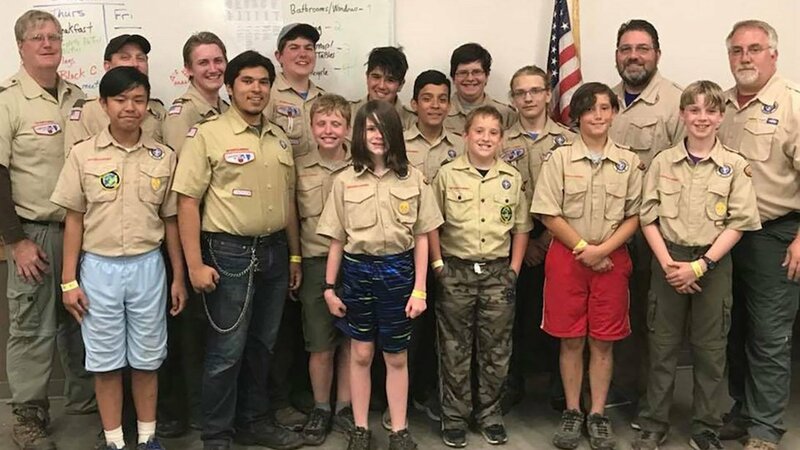 CHICAGO (WLS) -- A troop of Boy Scouts from Lake Zurich put their training to the test by jumping into action after discovering a motorcycle crash during a hike in South Dakota in June. Officials from Medicine Mountain Scout Ranch said Boy Scout Troop #93 was hiking in South Dakota's Custer State Park when they heard a motorcycle slide off the road and onto a rock ledge near Highway 87. Five of the Scouts and their Scout Master ran to assist the two riders who were trapped under their motorcycle. The Scouts worked together to lift the Harley-Davidson off the unconscious riders and prop it up on a rock. Several Scouts stayed on the scene to provide medical evaluation and divert traffic, while others went up the road to call for help. The Scouts who went for help were able to find a fellow hiker who happened to be a trauma nurse, who came to the scene to assist before paramedics and other emergency responders arrived. Both riders regained consciousness before being loaded into an ambulance, officials said. Ranch officials said the troop credited their training and participation in first-aid competitions for enabling them to respond swiftly to the situation. Medicine Mountain Scout Ranch is a property of the Boy Scouts of America, according to a local representative for the organization.